Nothing that writer-director Jason Reitman has done up until now could have prepared viewers for Labor Day. Between his political and economic critiques, Thank You for Smoking and Up in the Air, and his kooky collaborations with writer Diablo Cody, Juno and Young Adult—all original screenplays, by the way—a classic melodrama in the vein of Douglas Sirk based on a literary romance by Joyce Maynard seems an unlikely entry in his oeuvre. Yet here it is, complete with a pie-making scene inspired by the pottery tutorial in Ghost. Hewing closely to the narrative set forth in the novel, Henry (voiced as an adult by Tobey Maguire, played as a child by Gattlin Griffith) recounts Labor Day weekend 1987, when he and his recluse mother, Adele (Kate Winslet), are taken hostage by escaped convict Frank (Josh Brolin). Injured from jumping out of a hospital window and recovering from abdominal surgery, this brooding dude is at once threatening and gentle. He ties Adele to a chair in her own kitchen, then feeds her chili he made from scratch. As he hides out from the cops, Henry and his mom find it’s nice to have a man about the house again for home repairs, baseball practice and physical contact. For as unlikely as it seems, Adele discovers in her captor a second chance at love. Meanwhile, 13-year-old Henry is experiencing his own sexual reawakening over the course of these steamy New England days—a coming-of-age subplot that charges his understanding of the story’s emotional stakes. Peppered throughout are nostalgic flashes back to Frank’s past, clues about the crime that landed him in prison and hints that he’s a romantic family man at heart. Frank is played by Tom Lipinski in these scenes, a dead ringer for Brolin whose casting deserves an Oscar (if there were such a thing). Concentrated in one chapter in the middle of the book, this backstory takes on a more mysterious air when alluded to throughout the film and amplifies the narrative arc as the two storylines come to parallel climaxes. 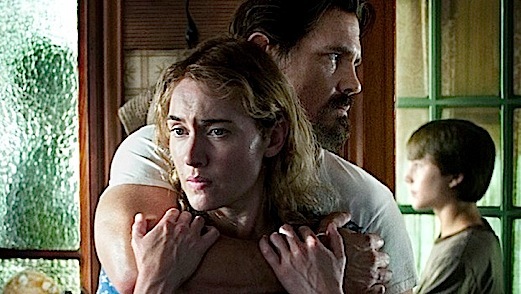 If Reitman’s goal here is to convince a skeptical audience of an unlikely love story—too intense to be dismissed as Stockholm syndrome—he succeeds, largely due to subtle character work by Winslet and Brolin. But with no leavening agents to lighten the mood, the recipe suffers from a tacky texture and sticky residue of melodrama.